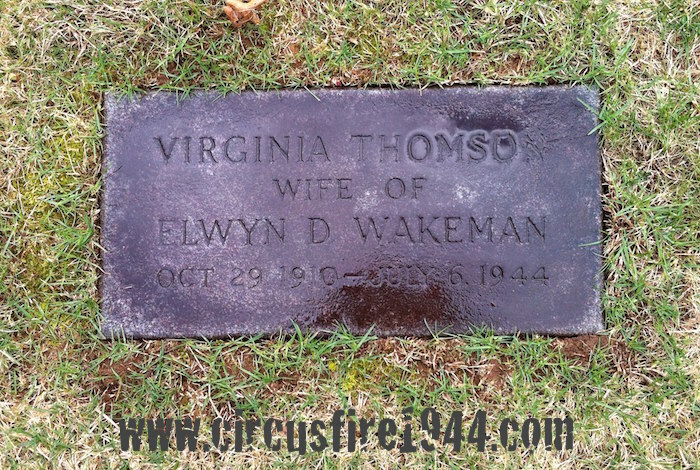 Mrs. Virginia (Thomson) Wakeman of 23 Grennan Road, West Hartford, was born October 29, 1910 in Hartford, daughter of Alice (Harvey) and Carlyle Clifford Thomson. Mrs. Wakeman and her son, Bruce, 7, were found dead at the circus grounds after the fire on July 6 and were buried at Fairview Cemetery in West Hartford after services at the James T. Pratt Memorial Chapel on July 9. 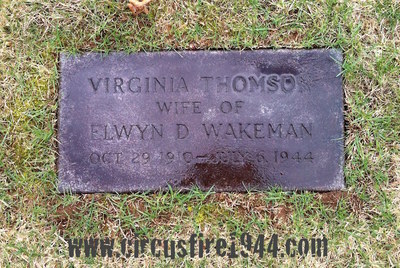 Virginia leaves her husband, Elwyn Darling Wakeman, 42; her daughter Sandra, 3; her parents, of West Hartford; her brother, Paul Thomson, 34, of Long Island, NY; and her sister, Mrs. Dorothy Jane Hart, 28, of West Hartford. 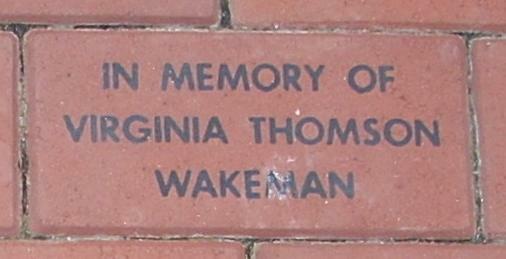 Body #2103 was identified as Virginia Wakeman at the State Armory on July 7 by her husband, Elwyn. 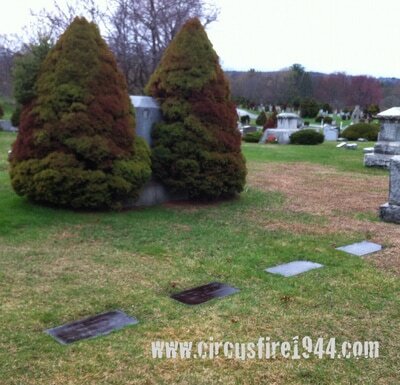 On the body was found a ring. The Wakeman family - Virginia, Elwyn, Bruce and Sandra - attended the circus together, along with Bruce’s friend Stephen Milliken, 6. 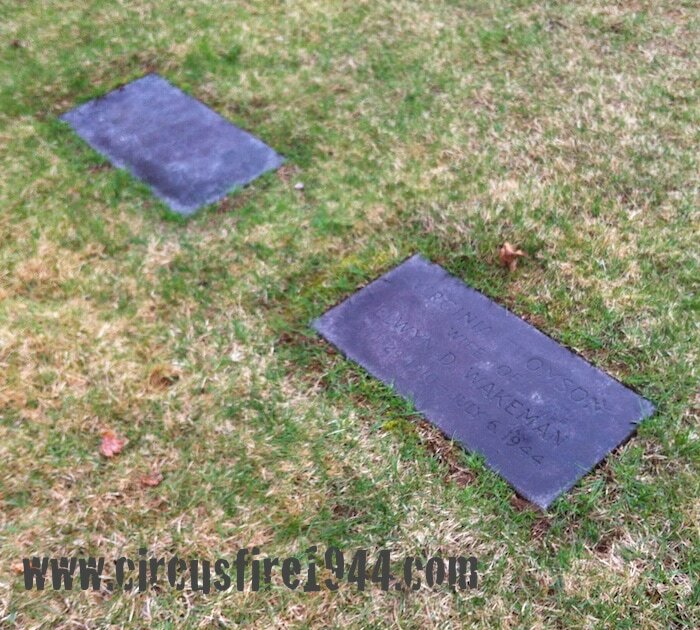 Only Elwyn and Sandra would survive the inferno. Virginia’s estate was awarded $11,000 by the arbitration board. 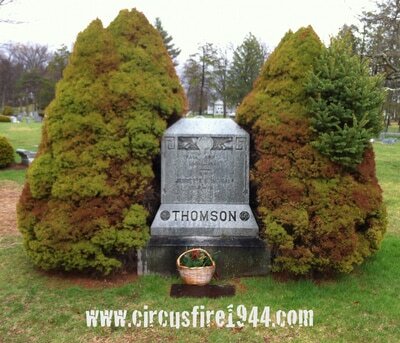 She was a 1928 graduate of Hall High School, studied at the Springfield Library School, and spent several years on the staff at the Mark Twain Branch of the Hartford Public Library.